The Detroit Red Wings needed a win on Monday night against the Buffalo Sabres and a win they earned, although the end was anything but uneventful. Their previous game was a 7-2 debacle as the Wings were unable to prevent the Pittsburgh Penguins from handing them their worst loss of the season. Hockey legend Gordie Howe was in attendance for the game, as the organization celebrated his 88th birthday. He was joined by his son Mark Howe in a touching moment in which anthem singer Karen Newman led the crowd in a singing of “Happy Birthday” on the Jumbotron. 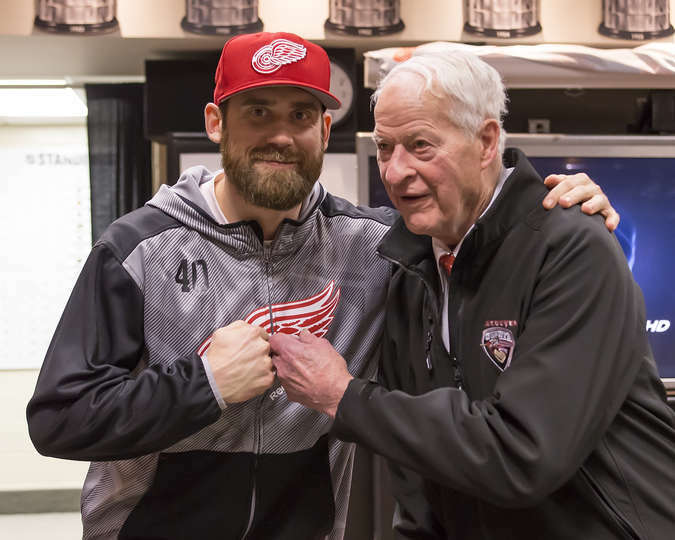 Last year, Howe received stem-cell treatments to recover from a stroke he suffered in late 2014. The Wings kept the Sabres to one shot for the first 14 minutes of play, but that total was not representative of the team’s defensive play. Buffalo had numerous chances to score but those attempts were thwarted by blocked shots. Detroit had 17 for the night, with Luke Glendening blocking five. One of their prime scoring opportunities came near the five minute mark of the first period, when star rookie Jack Eichel fed a cross-crease pass to Zemgus Girgensons. Glendening was able to slow down the pass and allowed goaltender Jimmy Howard to make an easier save. Detroit’s rookie forward Dylan Larkin put the Wings on the board with 1:28 to play in the opening stanza, only 23 seconds into a late man-advantage. Zetterberg took a shot and the rebound redirected to the stick of Larkin, who snapped the puck off the blocker of goalie Chad Johnson and in. At the nine minute mark of the middle frame, Riley Sheahan scored an incredible coast-to-coast goal that started at Detroit’s goal line and ended with the puck behind Johnson. He skated past three Sabres and ripped a rising wrister far side. It was an unassisted goal. Buffalo pulled their netminder with under four to play in the game. Glendening found the empty net with three minutes left on the clock, which would appear to end the game. However, Buffalo (still with six attackers) scored just ten seconds later, breaking Howard’s shutout. Girgensons scored far side, similar to Sheahan’s goal. With under two minute left, Justin Abdelkader tried to clear the puck out of the zone as Buffalo continued to press. His clearing attempt hit Sabres forward Ryan O’Reilly and stayed in. The puck then came to defenseman Casey Nelson who passed to rookie Sam Reinhart. Reinhart one-timed a slap shot from the faceoff circle to the right of Howard. The slap-pass play happened so quickly that Howard could not attempt a save, and the Sabres were one goal away from bringing the game to overtime. Buffalo nearly scored, but Detroit was able to clear the puck with 13 seconds left, securing the important victory 3-2. Adding to the importance of Monday’s two points was Philadelphia’s overtime win over the Winnipeg Jets. The Flyers moved to 35 regulation-plus-overtime wins (ROW), which matched Detroit before the Wings won. ROW is the first tie-breaker if the teams remain tied at the end of the regular season. The second tie-breaker is points earned in season series between the two teams. The Flyers won the first matchup between the two teams on January 17 2-1 in a shootout. On March 15, they also won 4-3 in regulation. That means that April 6’s contest will not change anything. Luke Glendening led both teams in blocked shots with five. Detroit had 12 takeaways, just one game after they had 12 giveaways Saturday. Every Detroit forward had a shot except for forward Anthony Mantha and defenseman Alexey Marchenko.